Silicon Integrated Systems is a Taiwanese corporation founded in 1987. It steadily grew around core logic and multimedia products. 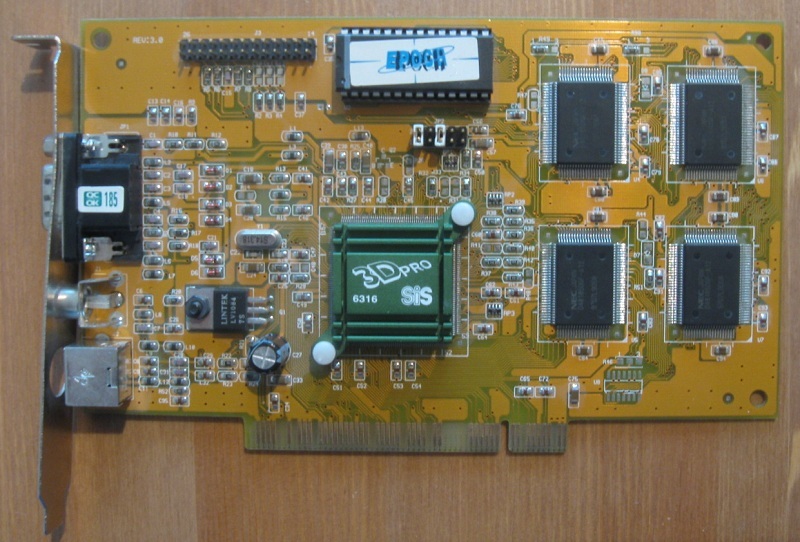 It was not until 1995 that SiS entered the discrete graphics market with 2d chips 62xx. 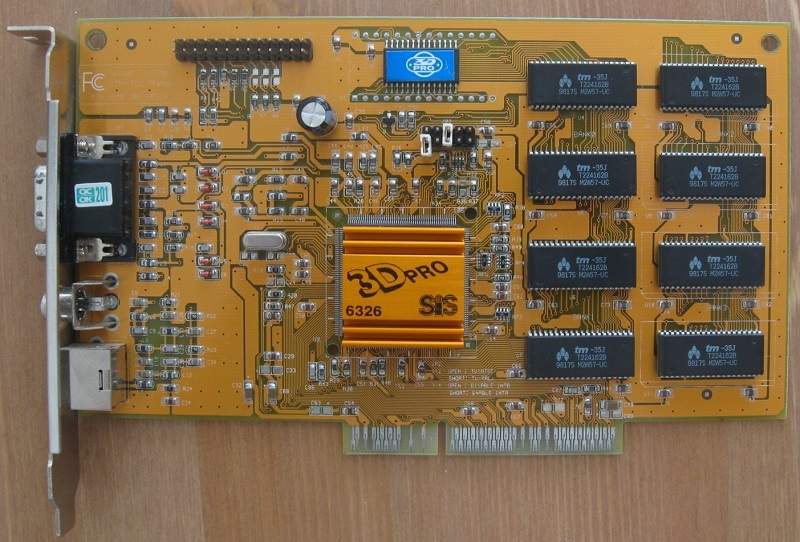 In 1997 they introduced their own 3d accelerator, gaining a significant foothold with one million chips sold, and delivered world first motherboard chipset with integrated graphics core. At one moment SiS was the only company in the world besides Intel with a full portfolio of 3C technologies, including CPU, core logic, 3d graphics, connectivity and advanced wafer fabrication. And their all in one graphics engine called "6326" was part of this success even if many gamers frown upon it or even all graphics cores of SiS. In the middle of 1997 3d gaming craze hits full speed and market is supplied with products of witty names, sometimes not far from mass murder. Among those SiS drops it's 3d junior called 6326. Did they think people will remember random numbers? Couldn't they come up with something better? Like Fragmaster 2000 Ultra or Napalm 3D Xplosion? I guess it would not fit well. 6326 isn't some speed monster, rather cheap multimedia product not pretending to be something it is not. From its first version 6326 had strong MPEGII decoder, later DVD revision just integrated MacroVision features. 6326 has built in rather slow 175 MHz true color ramdac with texture look up table. 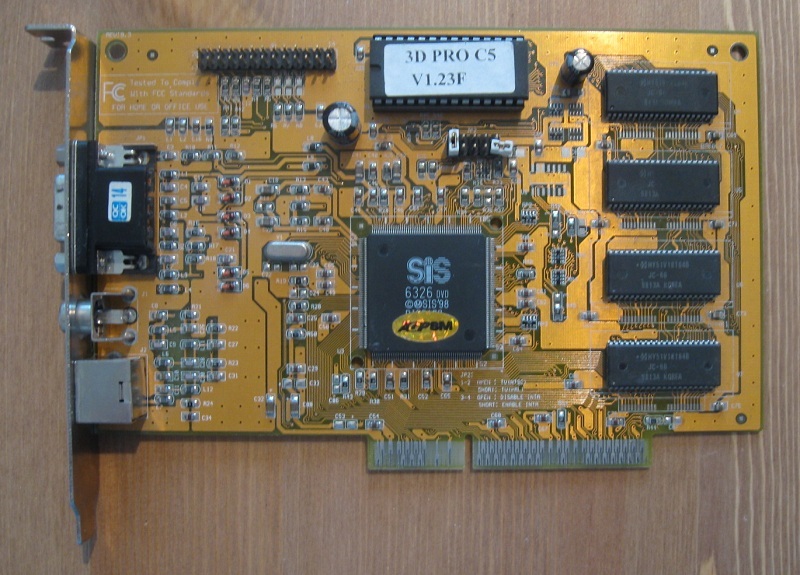 In summer 1998 came 6326AGP with niche DVD features and TV-OUT thrown out and instead implements full AGP interface. Which makes little sense to me, SiS at that time had to know performance of 6326 is too low to become gamers choice, but it still could be good multimedia product. The AGP chip was a hit nonetheless, easily outselling earlier revisions. On the internet was circulating information about the 2d engine being limited to 4MB of memory, but this seems to be true only for legacy VESA modes. The only feature SiS promoted over others is their Turbo Queue, an optional command FIFO in local memory in case 42 stages of hardware queue were not enough. It is a bad sign when company concentrates on promoting interface rather than compute power of the chip itself. AGP revisions supports 133 MHz bus with basic DMA transfers and sideband addressing, yet the queue depth is only two. Then there is a VLIW floating point primitive setup engine capable of triangle setup within 60 clocks. 6326 is on paper able to crunch 0.8-1 million 50 pixel big polygons per second, or even double the amount with 25 pixel polygons. From setup unit 32 bit data with 13 bit tags are sent at once to the rasterizer. Gouraud shading with dithering and specular highlights is calculated without any penalty. Texturing engine is flexible, handling rectangular shapes up to 512x512 and color formats from smallest palettes over mixed modes to 32 bit RGBA. It is supported by cache designed for holding eight samples needed for trilinear filter, using last recently used algorithm with estimated 90% hit rate. The bilinear texture filter is thus considered "full speed" (think no more than 20% hit) and even "trilinear" often has acceptable performance drop. Bilinear filter however is not smooth interpolation, but a gradual. This optimization is similar to ATi for example, the precision of 6326 is on par with Rage Pro. For untrained eye no really bad filtering showed up in games. Exceptionally, some specific textures are showing excessive color banding, probably because driver chose wrong format, or additional dithering. These should not be related to such filtering optimization. 6326 did not have a promising start. The very first C1 revision features only one texture coordinate and blending stage and suffers from broken texture perspective correction and fails one advanced blending operation. SiS later doubled those stages, perhaps in C3 already. I tried C5 and these bugs are gone. Vertex fog is properly blended with all surfaces. Z-buffer is implemented with rejection of hidden pixels in front to back sorting. Also alpha and scissored planes are tested at render output. 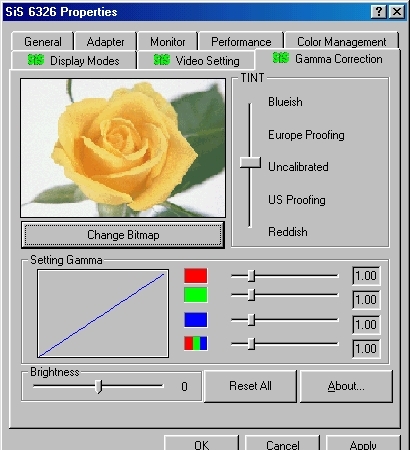 3d framebuffer color depth is limited to 16 bits and obviously dithered down from higher internal precision. SiS claims 40 or 45 megapixel/s peak fillrate, which rarely corresponds with real world performance. At least 6326 packs all the basic features needed for proper rendering of 90's 3d games. SiS tried to provide some extras in control panels, nothing 3d related though. To summarize revisions: first C1 and C3 seems to be limited to 4 MB, C5 can handle 8. 6326DVD was using C revisions and later added own D1 and D2. Finally 6326AGP chip is revision H0, I doubt G0 ever got out in the wild. Quite a family and considering vendors had liberty to use any memory they liked, there is a large variety of 6326 cards. 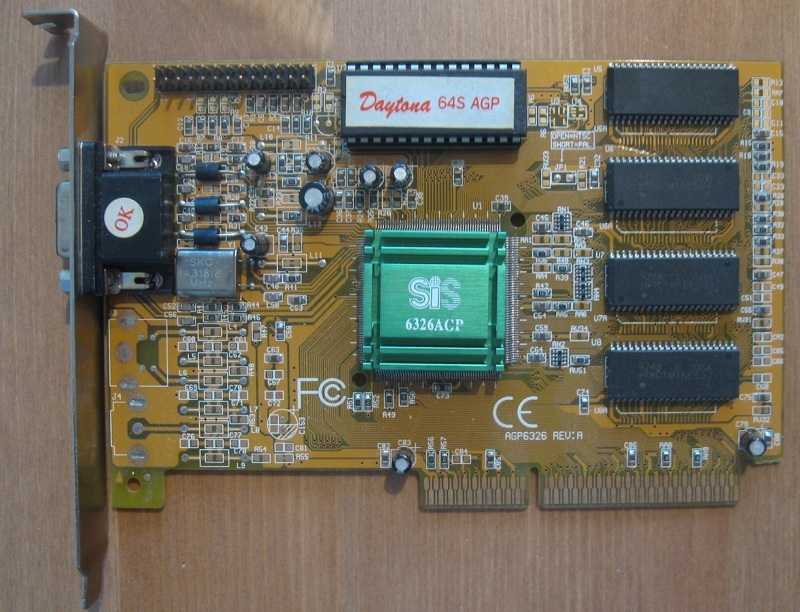 But finding earlier chips was quite though, it seems most 6326 cards were by far equipped with the AGP version, no matter which bus they utilized. Since first revision 6326 featured strong idct mpegII decoder, as Miro is promoting here. First review was done with 6326AGP even if its release date is on the edge of my scope. Back then all three cards in my possession were this version anyway. All of them are equipped with 8 MB of different memory type, memory bus width is casual 64 bit. Diamond A50 is one of the best 6326 performers thanks to 100 MHz SDRAM memory and I chose it to represent the AGP revision. But 6326AGP was used with slower EDO as well. With a chip rather slow can there be much of a difference? Having AGP boards with all three types of memory, quick answer is possible. Here is a little shootout between SiS 6326AGP with 8MB of 50 MHz EDO and A50. Yes, memory bandwidth is important. EDO cards are known to be minimally overclockable and mine confirms this after few extra MHz. A50 can do 15% percent more. However the SGRAM AGP card, with chip clock lower than others, maxed out PLL no sweat. I thought maybe with some crystal mod I could become lucky owner of the fastest 6326 "evah", but the DAC is tied to the same source. I will update this article later if it will be worth it. Interestingly enough SGRAM cards act like their chip clock is significantly below others. Now (Jan 2013) I can finally add results from early versions, starting with C1 featuring 4 MB memory and PCI bus. Since the beta driver release code named Java with OpenGL ICD was buried in the depths of the internet allow me to save the suffering of other geeks by providing the library here. But guess what, you can play some GlQuake on 6326 without it, because it is compatible with the S3 Quake wrapper for Virge. There is some hud corruption, but I am still surprised it works. What more at 640x480 the Virge wrapper is a bit faster than 6326 ICD. Real gift is Mpact 2 wrapper, properly working and fastest, it became the choice for first and second Quake engines instead of the ICD. Quake 3 is where ICD belongs and to my surprise, the game is rendered correctly with advanced effects. Outside of Id world I tried Star Siege, again succesfully. Why SiS aborted the OpenGL support is beyond me. Definitely not bad for a budget card. Screenshot cannot show occasional Z artifacts though. The start however was rather rough. First revision C1 seems to be another chip with broken perspective correction engine. Many textures on large polygons are warped, shaking, sometimes even rotated. Even some 2D elements like HUDs can float by few pixels here and there. Four megabytes of video memory are sometimes not enough, C1 did not use texturing from system memory and dropped some textures in Incoming. Most of the cards have a jumper to enable own interrupt handling. I tried both to be sure whether it influences transfers with system memory, but it made no difference. Local memory management is problematic as well, games like Formula 1 or Motoracer 2 requiring minimum of four megabytes can reject the card- perhaps precious kilobytes allocated for Turbo Queue are to blame. Viper Racing scaled down textures even at 512x384, Populous could not run at resolution above 400x300. In Expendable and Resident Evil 6326 C1 rendered utter garbage. Common bug is found in Grim Fandango, where wrong z occlusion makes characters hide behind some backgrounds. While driver reports support for all blending modes, actual rendering has issues in modern engines like Half Life and Quake 3. Here is the gallery to see more. Since C5 blending is correct and most of perspective problems are fixed. However cases of unstable textures remained, so it still cannot be considered as correct and accurate per pixel division. The image quality of 6326AGP is fine but few things are still lowering overall impression. Major flaw is how some 2d images seem distorted, for example characters in Myth or fonts in Incoming and Unreal. It is very annoying and absolutely inexcusable bug seen in whole 6326 family. Second, smoke effects are still skimpy, sometimes hardly visible. It is just a bit of white shade thrown onto your screen. Third the texturing likes to drop samples at further mip maps, but the amount of shimmering is within expectations of the time. Having started testing with Windows 95 I used last driver for the system- 1.28. Thanks to that I saw properly lighted Unreal which does not happen with last Windows 98 driver. On the other hand Expendable was broken with older drivers. Also Incoming showed some excessive color banding. 1.32 driver on the other hand selects ugly format for space backgrounds in Wing Commander Prophecy. To see screenshots of 6326AGP visit this gallery. 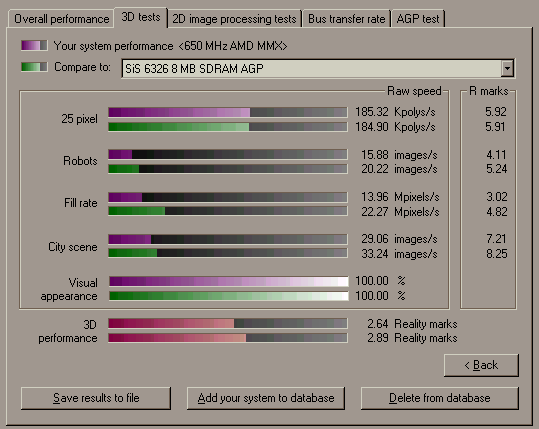 3d performance of 6326 is rather low, unlike what theoretical fillrate suggests it does not have enough power for gaming at 640x480. The sweet spot is usually at 512x384. Lowering resolutions further does not help so much like with Virge for example, so the bottleneck is likely somewhere in the early stages. I have to comment on 2d speed as well. 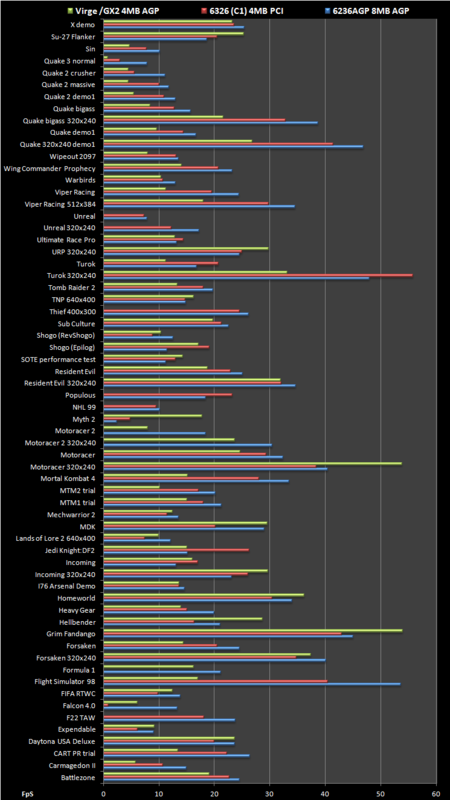 DOS performance is lower than others and that does not come from any benchmark, one can tell the difference just by text scrolling. 6326 did not feel very fast in Windows as well, but it does its job. I picked Virge /GX2 for comparison, but now it was obviously an undershoot. 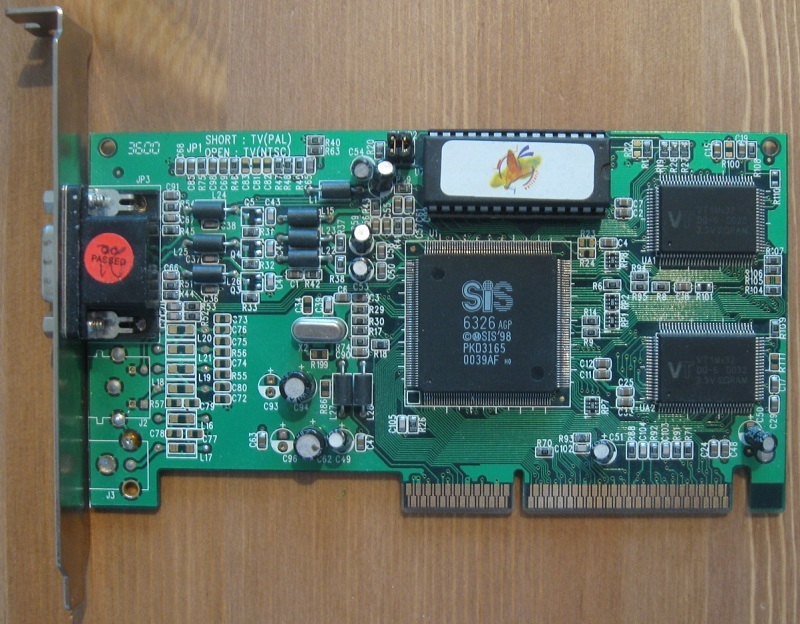 Even C1 chip with four megabytes and PCI bus can beat GX2, this particular card with 74 MHz memory did so by 30%. Therefore, it is safe to say even cheapest 6326 cards with 50 MHz memory will outrun fastest Virge. 6326AGP in its best does obliterate GX2 in frames per second by almost 50% plus it provides a lot better experience thanks to the proper rendering of even newer games. 6326 in Windows worked to my satisfaction and with rather robust multimedia software, which was typically bundled with those cards it probably was good and cheap universal graphics card for people not demanding high gaming performance. 3d engine has its weaknesses, first revision actually had serious bugs. Still the compatibility is impressive. To be crowned as king of budget few things were missing: perfect texture perspective correction, smoother dithering, and more accurate z-buffering. Anyway, once SiS polished the silicon 6326 became solid value 3d chip. With it's full triangle setup, texture cache and optionally beefy MPEG decoder, 6326 outperformed more famous budget chips like those from ATi and S3. SiS graphics cores had safe haven in chipsets, 6326AGP was integrated with proprietary 100 MHz bus to SiS 530 and 620. But discrete 6326 chips sold quite impressive 7 million during 1998 alone, pushing SiS into top five. 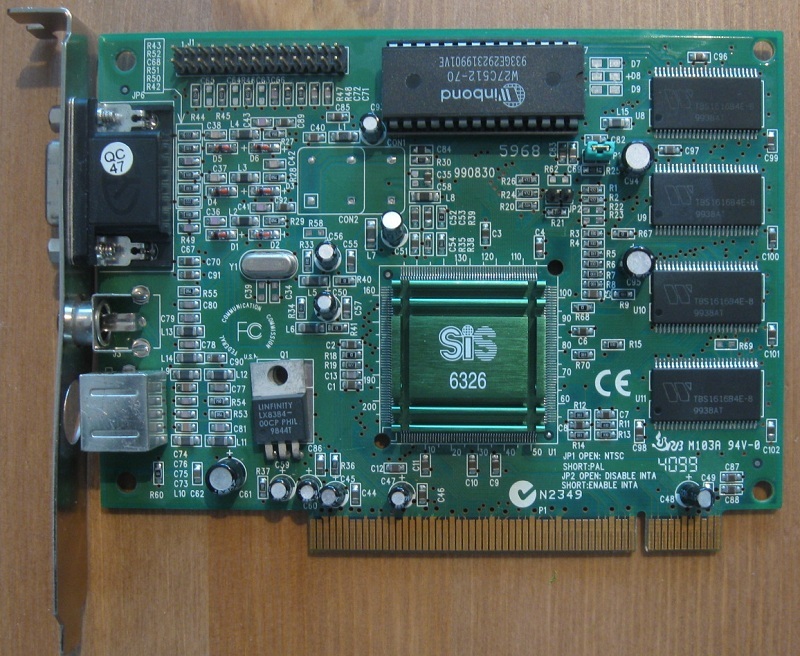 Thus, in 1999 SiS remained among technological leaders of integrated graphics chipsets, but in time when it could not find any manufacturing capacity to actually deliver them in numbers market demanded. SiS decided to go large and invested a fortune into own manufacturing plants and also acquired x86 CPU technology by purchase of Rise. 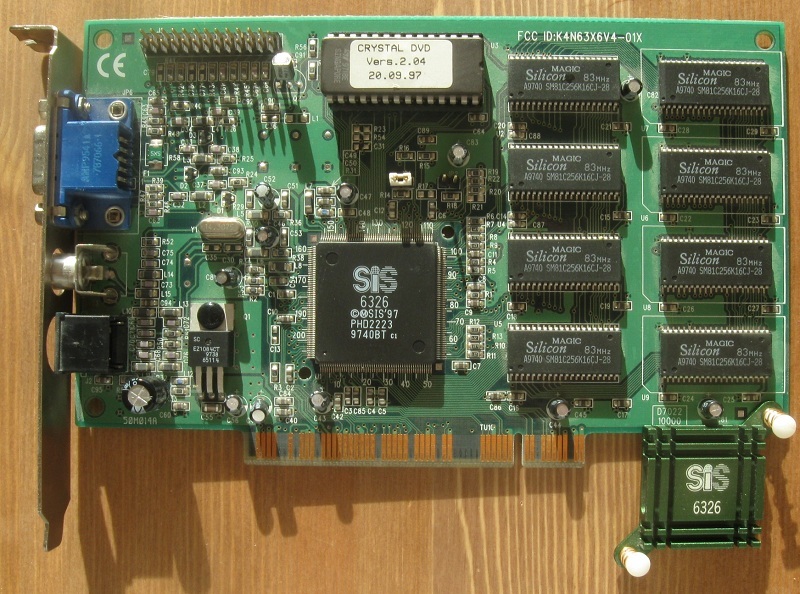 For discrete graphics SiS prepared 128 bit architecture numbered 300, but with uninspiring speed and higher cost was barely registered in the retail market. Later die shrink and reingeneered with 64 bit memory bus, cheaper "305" sold a lot more, but still not enough to regain former market share of 6326. SiS remained focused on low-end in 2001 and their first TnL chip "315" simply tried to do similar DX7 rendering as competition for "Asian" price. But the uncertainty of solid drivers kept retail cold. At least chipsets business was again gaining momentum thanks to some great innovative designs. In 2002 SiS pumped out Xabre graphics cores and long overdue holy grail of the company: complete system on chip. 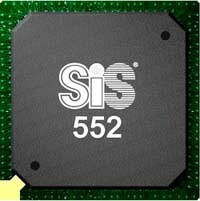 Peak of integration: SiS552 has x86 CPU, full featured north and south bridge, 2D & video pipeline of SiS315. It is easy to understand why SiS introduced Xabre family with previously non-existing buzz, older cores got very little space in media. It again had good price/performance ratio, was up to date in features and was sufficiently fast in fixed function rendering. But drivers with low quality texturing by default were cheap and Xabres just did not have enough hooks to turn the tides. With graphics business going nowhere SiS decided to get rid of anything not essential for integrated graphics. Newly formed graphics-only XGI company released second generation Xabre architecture under Volari name with more PR twists and hypes which fire backed pretty heavily and confirmed the underdog position of XGI. After little more activity in the market ATi purchased XGI in 2006. SiS was abandoning other challenging products through the years, sold it's fabs and today does not offer any key PC core logic anymore, despite buying back rest of XGI in 2010.